As nice as wireless connectivity is, we all know that a wall, door, brick, or metal construction components all lead to areas that have a lower signal then others. And, some homes and offices are built in such a way that to have a high speed wired network is difficult. 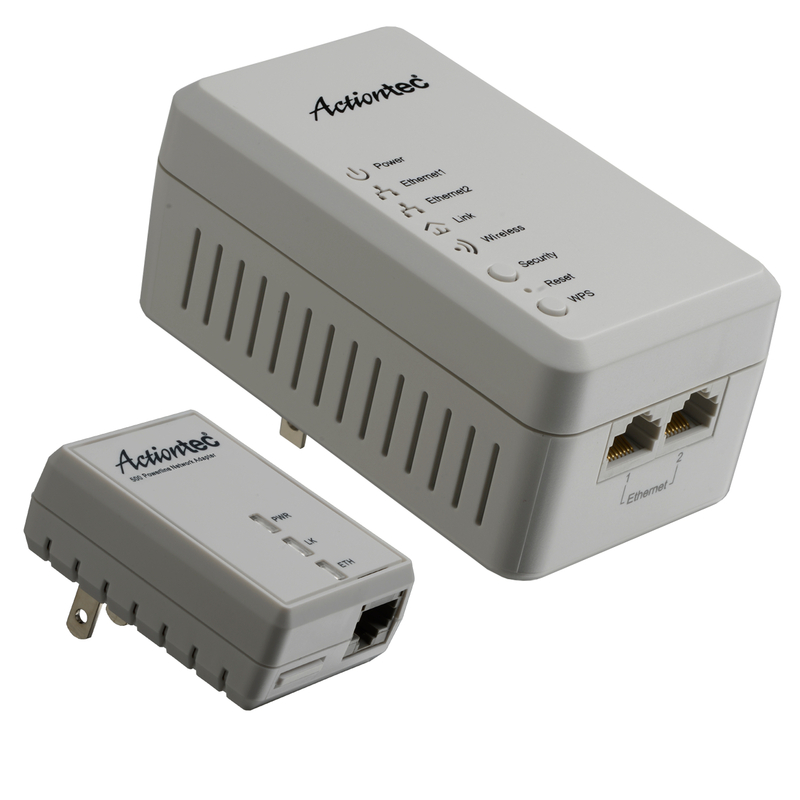 The Actiontec PWR51W Wireless Network Extender promises to turn your house wiring into both an extension of your Ethernet router, as well as provide a stronger Wi-Fi signal where you need it. We have reviewed what are generally known as Power-line adapters, two of which from Western Digital and TP Link. Both of those plugged into your router, and into the wall socket. A receiver in another room provided an Ethernet socket to provide an extension of a network. A neighbor of ours built their game room in the basement, but nothing I tried gave a decent wireless signal down there, and it was difficult to actually install a hard-wired cable. So, I tried the WD and TP Link units, and voila, their consoles now reached the net. But, for Wi-Fi, I would have then had to attach another router to broadcast a signal there. If only I had the Actiontec PWR51W Wireless Network Extender at the time. The PWR51W is actually mislabeled, as it is a combination of two Power-line adapters, a Wi-Fi router, all in one, well-designed unit. The PWR51W consists of two parts, a small receiver that attaches to your router and plugs into the wall. The receiver is larger, sports two 10/100 Ethernet ports, and the Wi-Fi hardware, and plugs into the wall socket. I tested Power-line adapters years ago and found them wanting. They looked great on paper, but proved especially susceptible to noise, power load surges, and more. But time, and vastly improved digital signal processing have turned your house wiring into an effective hard-wired network. The ability to use either the Wi-Fi or Ethernet ports is fabulous for anyone demanding of download speed, for either gaming, video, or large data downloads. We would recommend taking advantage of both options, using an Ethernet connection to any computers or consoles where data download intensive activity takes place. The signal in rooms where previously only managed a bar or two, were now strong, stable, and fast signals. There are a couple of design decisions where we could see an upgrade. The larger receiver covers both sockets and doesn’t have a pass-through for AC power. To combat this we ended up using with a non-surge protector power-strip or extension cord, but most Wi-Fi antennas prefer a vertical mounting position, so not ideal, but we didn’t see much of a difference. For some the limitation of 10/100 Ethernet might prove problematic in terms of speed, and the Wi-Fi was fast, but not quite a fast as our original router, but for most home use, we felt it worked fine, but we would welcome a step up from the 2009 802.11n standard with greater range and penetration of obstacles. We would also love to see a pass-through port for the Ethernet connection. Does the lack of a gigabit Ethernet port really affect the user? In our tests, not really. First, most Ethernet wiring is CAT 5, not newer, higher capacity cable, especially if the wiring was installed more then 8 to 10 years ago. So, having a gigabit port is no guarantee of gigabit performance. Secondly, unless you are uploading or downloading really large files, the difference is often negligible in practice. Lastly, most ISPs limit speeds in order to get consumers to purchase faster throughput at an additional cost, and few consumers actually do this, so while most of our ISP's are pretty fast, we have seen slower 10/100 and 802.11G routers as default installs, even now. So, if you are a total techie, needing seriously fast connectivity, no Power-line adapters or Wi-Fi routers will ever replace running a dedicated cable, so we think that solutions like the PWR51W is ideal for most users not looking for specialized hgh performance. One issue that all Power-line adapters face is the actual wiring in place. Some need to be on the same circuit, others seem to work throughout a house. A colleague of mine had a Power-line issue since he installed dedicated AC sockets and circuits just for his computers with a higher amperage capacity, and when he plugged in a Power-line adapter into that socket, it wouldn’t communicate with a socket in a distant bedroom which was on another breaker. This wasn’t the fault of the adapters, but inherent in trying to hijack your electric service for something entirely different, so it is appropriate to test the adapters with that in the back of your mind. One other area that needs addressing is tech support, which is at the time of this review is somewhat incomplete. For example there isn’t a dedicated site for this kit, only the individual components. Actiontec's FAQ’s page does have the following link: "How to change the wireless settings for the WPB3000 Guide” that provides the steps to customize the unit. The good news is that they are aware of the need to beef up the site for consumers. The need to ramp up for consumers might be due to the fact that if you have heard of Actiontec, it is probably because they are a large OEM supplier to ISP providers. My first Verizon router was from Actiontec, as have several subsequent models. Some recent models including gigabit Ethernet. It often takes OEM suppliers a while to get into the swing of consumer based customer and technical support, but most companies typically get caught up in a hurry. Still, we would like to see Actiontec make such support a priority. How does it compare to traditional wireless boosters? I’ve tried those boosters in areas where I needed a stronger Wi-Fi signal with mixed results. First, I needed a strong signal to begin with for the boosters to work well, and secondly they seemed more sensitive to placement and construction features, so sometimes they worked well, other times, not so well. By comparison, the PWR51W was free from those constraints. As long as you have an AC socket where you want to boost the signal, it’s great. So, the next time you throw a party outside, and want your guests to ignore each other by staring at their phones instead of each other, or if want to stream a movie in your backyard, the PWR51W makes it all possible with fast download and upload speeds. One feature we really liked was the Security button that connects the unit to your network, and no others. This is especially useful for anyone in an apartment or condo setting. We feel that the Actiontec PWR51W Wireless Network Extender is a solid, well designed, easy-to-use, painless approach to extending the reach of your home network with no muss or fuss, and is an affordable solution for the home user. Highly Recommended. Harris Fogel, with additional reporting by Thomas Fogel, posted 6/22/2014.